Any tool for inspecting GTK3 elements? gtkparasite is great for gtk+2, but unfortunately it won't work with gtk+3. If you are looking at all the possibilities that can resolve the problem, I suggest the following link which is about how to port gtkparasite to GTK3. Although it is a bit technical, the effort is successful. gsettings set org.gtk.Settings.Debug enable-inspector-keybinding true and launch the debugger with the Control-Shift-I or Control-Shift-D keyboard shortcuts. Not the answer you're looking for? Browse other questions tagged gui gtk3 or ask your own question. 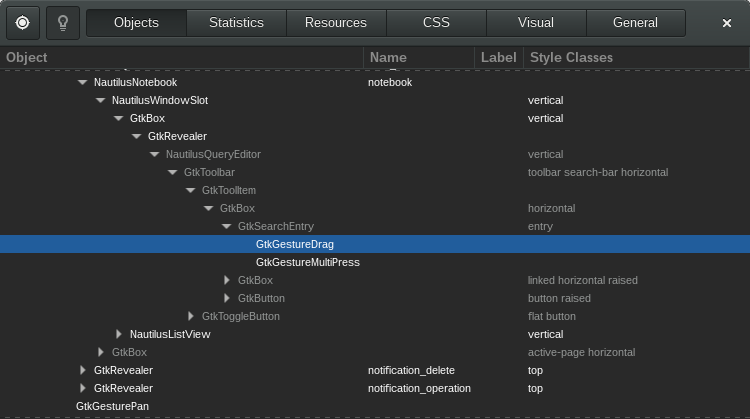 What theme works well for both GTK2 and GTK3 applications? How can I disable this GTK3 scrollbar behaviour? Tool to inspect desktop theme elements?